I recently submitted an updated version of the italian translation, along with some bugs and problems I found. I'm posting those here as well so anybody can see them. Maybe other translators could also tell if they found the same problems? - line 5941 (New) is added to line 2804 (Collection options) to make the title of a panel (Options>Media Tree>Add new collection). This causes confusion when the strings are localized because, even if 5491 wasn't used anywhere else and thus could be changed to fix the problem, it should be added within the middle of 2804 to make sense. Maybe a separate line should made for that title? - it's my understanding that lines 8499 and 8504 (Open in Explorer) are used to open folders and bookmarks in Windows Explorer and Internet Explorer respectively. This, in my opinion, is confusing and makes the (quite wrong) assumption that everybody will be using or willing to use Internet Explorer as a browser. 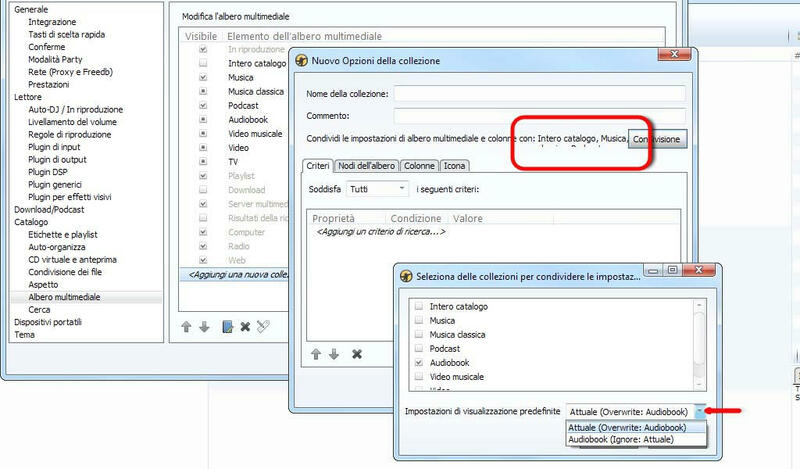 But the point is that Windows Explorer got translated to something different in Italian, so I'd prefer not to use the same word for both. Again, my suggestion would be to split it in two different strings. - line 10499 (Incompatible) is added either in front of 10492 (audio) or 10483 (video) to make the rule descriptions in Options>Portable audio devices>Settings>Options>Autoconversion. Unluckily the order has to be inverted in Italian, so the result is wrong. Maybe the %s feature could be used instead? - line 6357 (Nothing) is added to 11267 (selected) to make the hint displayed when hovering the mouse on an empty collection in Options>Portable devices>Settings>Autosync list. No problem here but looks like 11267 is used for something else which I couldn't find, and I want to make sure it's ok to use the same translated string. - when in Options>Media tree>Add new collection>Sharing, after a new collection is selected, a drop-down list pops out which contains lines featuring two untranslated words (Overwrite and Ignore). Also visible in image 4. 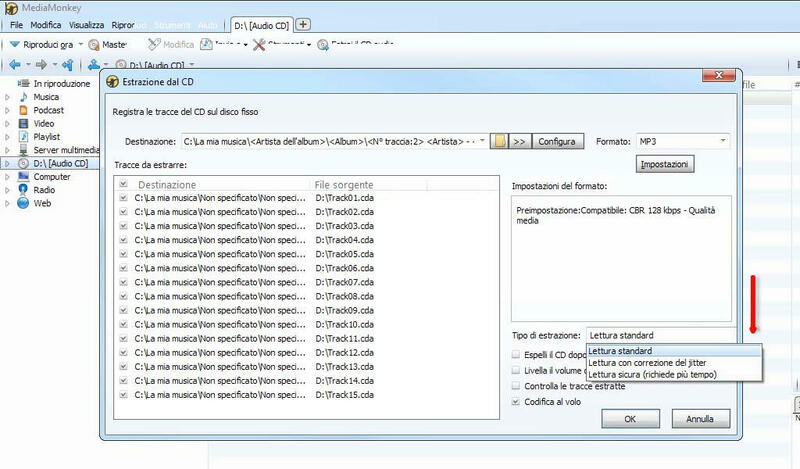 - when converting an audio file to another format via Tools>Convert format, selecting FLAC as the format for conversion brings out an untranslated string in the format settings summary box (Compression level:). I couldn't even find this string in the files. 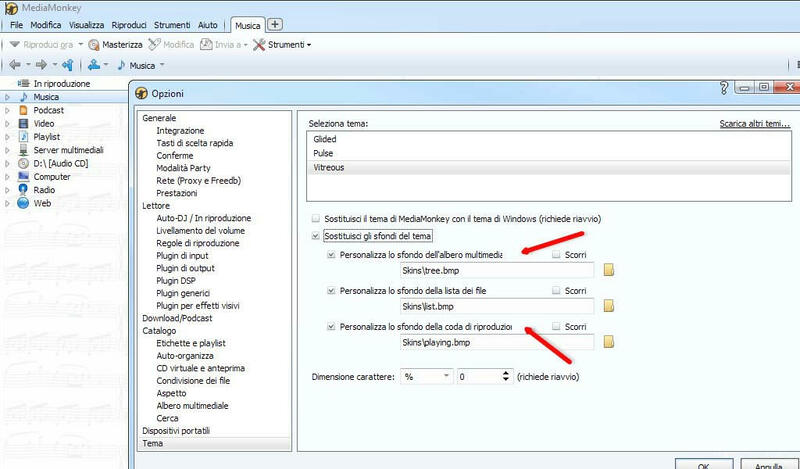 - when converting a video file to another format via Tools>Convert format, select AVI as the format for conversion, then enter the settings panel and go to the Audio tab: in the drop-down menu for Sampling Rate there's a value called Original, which is not translated to Italian. - on the list showed in Options>Media tree the item Audiobook is not translated. - the generation date printed at the bottom of library statistics report (File>Create report>Statistics) uses days and months in English. Can't find the corresponding strings in any file. Also for future reference, I should be able to use the date format day/month/year for Italy. - Options>Playback rules: the button on the bottom right is too small to fit text (should have variable width). - Options>Download/Podcasts: those drop-down boxes don't scale as other boxes do and they cut text from the selected line and from menu voices. 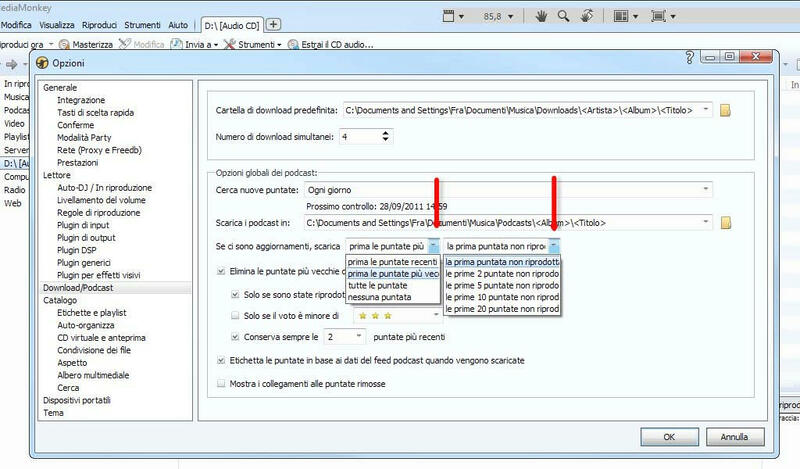 - Options>Media sharing>Add>Autoconversion>Set formats>Add new format: text is cut out by boxes or other text. - Options>Media tree>Add new collection: there's not enough space for multiple collections and the list is partially cut out and largely hidden. - "Options>Themes": text is mysteriously cut out. 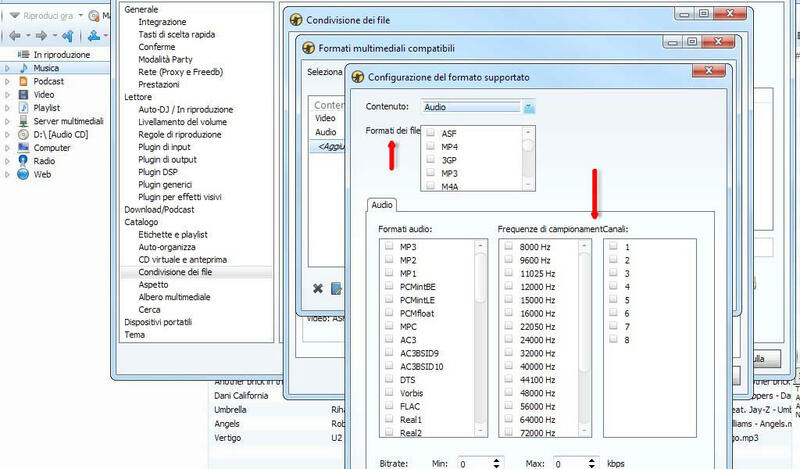 - Audio format conversion via "Tools>Convert format": on MP3, WMA and WAV settings panels the same string is always cut out and some drop-downs don't scale, thus cutting contents out. Left and middle side of the image. 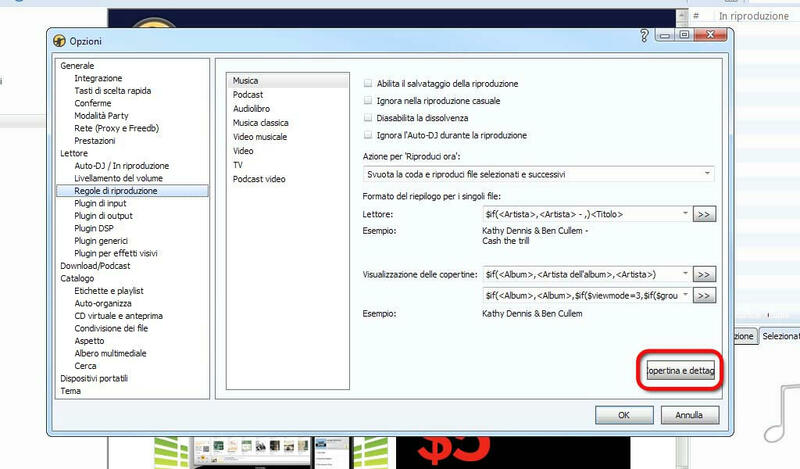 - Video format conversion via "Tools>Convert format": all of the formats share the same Audio panel errors, cutting out some text and leaving useless blank space. Right side of the image. - CD ripping panel: a drop-down box is cut out by the window. It can still be clicked and navigated, but then it overlaps the window border. Fraxav uses a Windows XP Home Edition SP2 on an Acer Aspire 5670 laptop with an Intel Core Duo T2300 (1.66 GHz) processor, ATI Mobility Radeon X1400 512 MB, 100 GB Hard Disc and 1 GB DDR2 Ram.